Much thought and accumulated experience have gone into the matters of production of suitable headgear both from the points of view of decoration and protection. Top row: Hats 1666, 1670/84, 1695, 1700. Second row: Three cornered hat for private soldier and an officer. Third row: Grenadier caps 1685, 1742, three cornered hat private soldier, grenadier cap 1751. 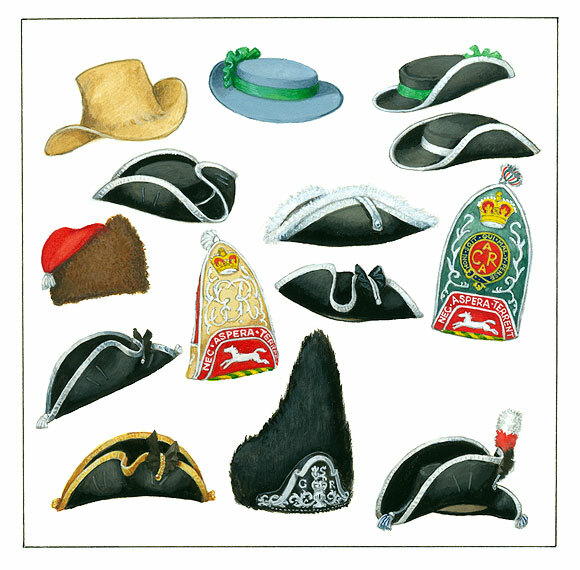 Fourth row: Three cornered hat 1768, light infantry cap 1782. Bottom row: Bi-cornered hat 1782, grenadier cap 1768, bi-cornered hat 1795. From the time of Cromwell’s New Model Army of 1645 broad brimmed Flemish hats were introduced to the soldiery and were worn with a metal skull cap sewn inside the crown for physical protection. After the restoration of the Monarchy there was an intermediate step of the famous Monmouth Cap, a broad-brimmed, low crowned felt hat. One side of the brim was generally turned up. Then came the tall Flemish hat was developed into the low crowned Carolina hat of felt bedecked with tape edging and ribbons. For ease when performing musket drill one side of the hat was looped up but as this did not look very tidy the other side was soon looped up as well. This in turn led to the development of the three-cornered hat. Officers in Marlborough’s Army wore full bottom wigs liberally curled and long enough to reach the shoulders whilst the men cut their hair short. By George II’s reign officers’ wigs had become smaller and were tied back with black silk ribbons. They were decorated with powder. Themen’s hair, now worn long and tied in a queue, was smeared with tallow or lard and powdered with flour. Men who carefully prepared their hair on nights before a special parade were known to sleep face downwards to avoid disturbing it before morning. The queue was worn in a bag, secured with black ribbons tied according to a regimental pattern. This kept much off the red coat. The grenadier cap was introduced in James II’s time as the wide brimmed hat interfered with the throwing of grenades. The first version of this headdress resembled a stocking cap and was decorated with fur and a tassel. Gradually this developed into a mitre shape with regimental devices on the front. 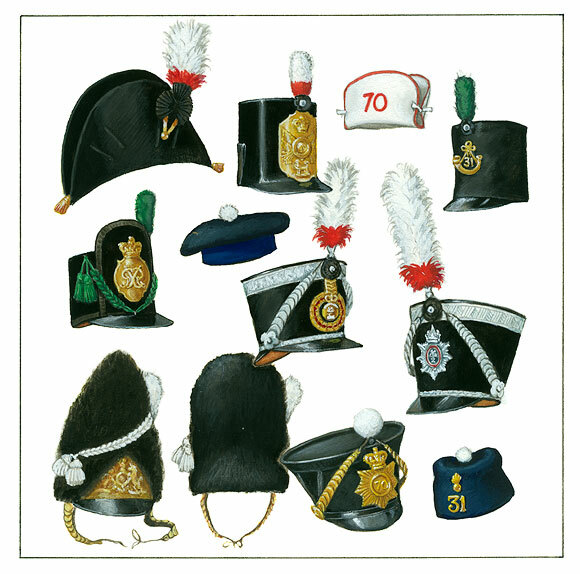 Officers’ caps were beautifully embroidered in coloured silks and many examples still survive. By the end of the eighteenth century hair powder was being phased out and by the time of the Napoleonic wars queues were abolished by a War Office Order of 1808. The Royal Welch Fusiliers were the last Regiment to lose them, thereafter wearing a flash of black ribbons on the backs of their collars as souvenirs. Top row: Officers hat 1800, Shako 1800, Forage cap 1806, shako 1806-1812. Second row: Shako 1812, Forage cap 1815, Shako 1816, Shako 1820. Bottom row: Grenadier caps 1816, 1835. Shako 1828, Forage cap (Kilmarnock) 1834. 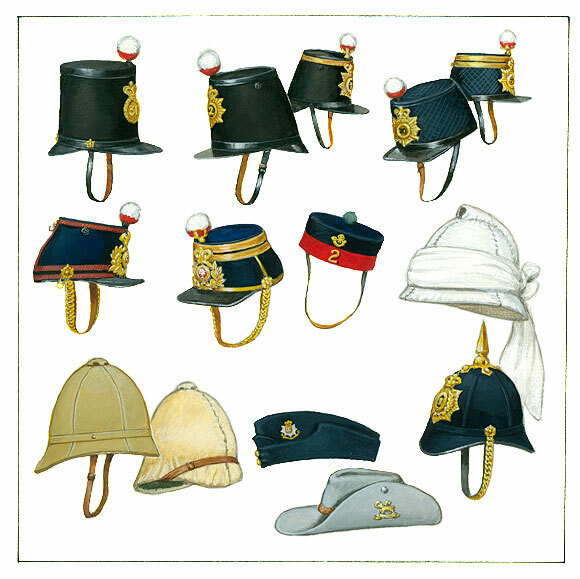 The various decorative forms of the cocked hat, in use for over a hundred years, disappeared at the beginning of the 19th century with the introduction of a more practical, cylindrical and peaked, shako. In 1800 the shako was made of leather and was decorated with a large brass plate on the front. This proved too heavy and was changed to a lacquered felt version with the same plate. In front, above a black cockade, was a short tuft coloured according to company. White over red for the centre company, white for the grenadier and green for the light infantry companies. These coloured tufts continued, in various forms and lengths, until the introduction of the last shako. In 1811 a lighter, smaller version was introduced. This had a raised front similar to the Hungarian casquet and was the shako worn during the Waterloo campaign. Although it was withdrawn soon after the battle it became known as the Waterloo shako. With the introduction of this shako officers were directed to wear the shako in lieu of the cocked hat. There was some resistance to this directive and they were allowed to wear the hat at levees and at court for a few more years. After Waterloo military fashions ran riot with decoration taking precedence over practicality and comfort. Foot Guards wore bearskins (the latest version of the grenadier cap) which were so high that taller sentry boxes had to be installed to accommodate the wearers. In cavalry regiments Lancers wore Polish style uniforms with square topped caps while Hussars adopted the Continental type busby. The Household Cavalry appeared in bright steel helmets with fur crests so high that they could barely be kept on the head. Infantry regiments discarded their Waterloo shakos in 1816 for an improved ‘Prussian’ style of black felt with a glazed top which was slightly wider at the top and with a peak at the front and the back. This soon evolved into the Regency shako much wider at the top and rather bell shaped. Regimental lace, in silver or gold, decorated the top and bottom edges of this shako. It was quite heavy. As extravagance became rife so the shako, although it lost its regimental lace, soon became festooned with cords and with ridiculously long feathers. By 1844 the authorities had had enough and ordered the removal of excessive lace from the uniforms and introduced a new shako. Supposedly designed by Prince Albert, the new shako (called the ‘Albert’) was almost a reversal to the original shape. It was tall and cylindrical with a leather top and with a peak before and behind. The badge, which had evolved over the years, was the same as that worn on the bell topped shako. During the Crimean war the Albert proved impractical for active service and the round, undress, Kilmarnock forage cap was worn by most of the regiments engaged. The shako remained for full dress. Top row: Shako 1846 (Albert), Shako 1855 other rank and officer, Shako 1861 (Quilted) other rank and officer. Second row: Shako 1868 other rank and officer, forage cap 1860, Linen covered cork or straw helmet 1857 (India). Bottom row: Foreign service helmet 1875 and 1890, Glengarry 1857, Field service cap (Austrian) 1895, Slouch hat 1900, Home service helmet 1879. After the Crimea a second lighter shako, after the French style of the period, was introduced. It can still be seen today worn by the Band of the Royal Corps of Transport. Within five years a much lower shako similar to a kepi was introduced. This was made of cork and was covered in blue cloth. The cloth was stitched to the cork in a diamond pattern and was dubbed the ‘quilted’ shako. In 1868 yet another shako was introduced. This was possibly the most elegant of all, based on the previous style but tilted a little more to the front, with gold lace for officers and red braid for the men. This was the last shako. The Home Service Helmet was introduced in 1879 and was similar in shape to the German ‘Pickelhaube’ of the period although higher in the crown and made of cloth covered cork. As with the German helmet it had a brass spike on the top. It can be seen today worn by regimental bandsmen in full dress. (Several examples can be seen at Clandon Museum). Disastrous experiences in the Zulu and Boer Wars led to the abandonment of decorative uniforms in field conditions and to the development of khaki uniforms with appropriate headgear. The cloth covered Foreign Service Helmet, in use for some years in India and worn at the beginning of the Boer War was gradually superseded by the slouch hat turned up on one side. This is the hat familiar to WW2 forces serving in the Far East. Various forms of undress cap had been worn since the Kilmarnock. Firstly the Glengarry which was followed by a blue Field Service Cap with folding neck cover and, in 1902, when the former scarlet undress frock was abolished, by the Brodrick cap. This was a blue cloth, peakless, round cap with a flat top with a regimental badge on the front. Khaki service dress, introduced in 1902, was thereafter worn on all occasions, except those where full dress was required. In these first years of the 20th century the blue Field Service Cap, the Brodrick and the Slouch hat could all be seen in wear. The Brodrick was unpopular and was replaced, in 1905, by a round, khaki, peaked cap which continued in use until the outbreak of WW2. At the same time a blue version of the peaked cap was introduced for wear in walking out when the full dress tunic was worn. During WW1 several versions of the khaki Service Cap appeared to accommodate the conditions of modern warfare. The steel helmet was introduced in 1916. Top row: Brodrick cap 1902, Khaki service cap 1906, Trench cap 1914 (Gor’ Blimey), Soft field service cap 1914. 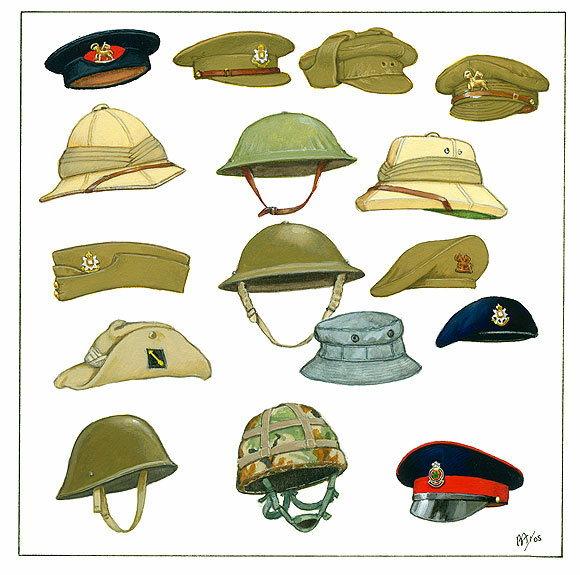 Second row: Wolseley helmet 1902/1940, Steel helmet 1916, Solar topee 1910/1940, Third row: Field service cap 1937, Steel helmet 1937, General service cap 1944 (plastic badge). Fourth row: Slouch hat 1916 and 1939, Jungle hat 1950, Beret 1950. Bottom row: Steel helmet MkIII 1944, Helmet 1980, Coloured forage cap 1968. In 1938 Service Dress underwent radical change with the introduction of Battledress. The Field Service Cap of the 1890’s was re-introduced as a khaki version and was worn on all occasions except when the steel helmet was worn. During WW2 the Field Service Cap gave way to the General Service Cap which was disliked almost as much as the Brodrick. It had a one inch cap band and a wide round top, similar to a Scottish Balmoral, which was worn pulled down on the right side. A cap badge was worn, on the top part, to align with the left eye. Cavalry regiments and the Tank Corps wore a soft beret which was much sought after and worn, if you could get away with it, by anybody else. After the war it proved a useful, practical and comfortable cap which also had a reasonable regimental appearance. It is still worn by the soldier of today. Military head-dress had its counterparts in the civilian services. The Brodrick was worn by many fire brigades up to WW2 and the Home Service Helmet, with silver metal ornaments, can still be seen today in many police forces around the country.